Eleanor and Louisa Piper have now returned from their thirteen day trip to Rosario, Argentina where they competed for GBR in the World Youth Archery Championships. Eleanor (age 18) competing in the U21 category, which consisted of 64 archers from 26 countries, and Louisa (age 14) in the U17 category of 93 archers from 44 countries. This was both of the girls first experience of competing at a World level and their first experience of long-haul flying! In totality this was Eleanor’s sixth international, she has previously won two European Silver and one Bronze medal, and Louisa’s second international having debuted at a European level earlier this year with an Individual Bronze and a Team Gold. October in Argentina is their spring and unfortunately the weather conditions were appalling! The night they landed there was a huge storm which took down all the competition tents, electronic scoring systems and flooded the field; as a result Unofficial Practice on the Sunday was completely cancelled and even Official Practice on the Monday was reduced down to just an hour and a half. Strong winds continued throughout the week with archers and chairs being blown around and arrows even ending up on the wrong targets! Eleanor finished the Qualification round in an impressive 23rd place shooting her second best WA70 score ever and gaining a Bye straight into the 1/24th H2H matches. Here she met Brazil who she saw off with a 6-2 win to pitch her against the Number 10 seed from Japan. 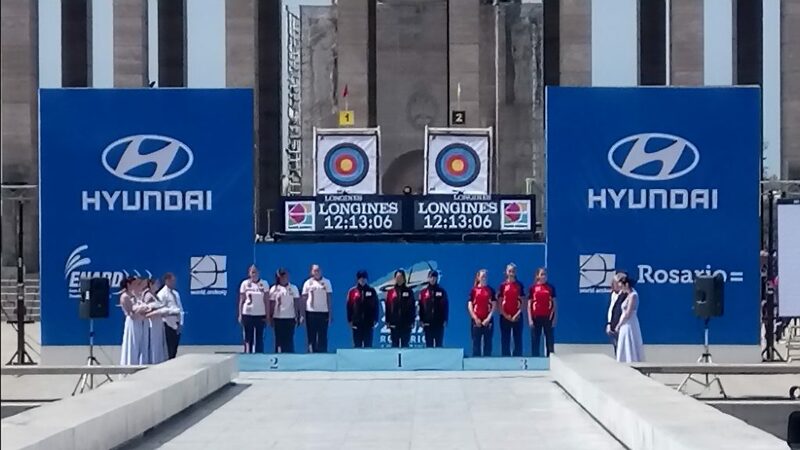 Eleanor fought hard and took her to a Tie Break (one arrow, closest the gold), both girls shot a nine but Japan’s was closer to the gold by less than a cm! In the Junior Women’s Team event Eleanor and her two GBR teammates made it through to the last eight in the World but could not get past the Number Two seeds Chinese Taipei who eventually went on to win Bronze. Eleanor was extremely pleased with her performance on the back of a season where she has juggled training with sitting her A Levels. She is now at Birmingham University studying Materials Science on a Sports Scholarship and is very much looking forward to competing for both Birmingham and GBR in 2018. Louisa, 6th youngest in the competition of 93 archers, finished Qualification in 19th place as both the highest placed U15 and the top GBR cadet girl archer, meaning that she earnt a place (along with the top GBR boy) in the Mixed Team event. Her qualification ranking also gained her a Bye into the 1/24th where she beat Malaysia 7-1 to set up a 1/16th match with the 16-year-old Number 14 French seed, who had beaten her in Croatia in the semi-finals putting Louisa into the European Youth Cup Bronze medal match before going on herself to win Gold. It was to be the same outcome once again but with the French seed going on to win Silver this time, succumbing in the finals to the eventual Gold Medal winning Korean Archer – next time Louisa is determined to win out! In the Cadet Women’s Team event Louisa was again teamed with her fantastic European Gold Medal winning teammates who she shot with out in Croatia. First up against the Number 10 seeds India in the 1/8th the girls won 6-2 to set up a challenging match against the Number 2 seeds Chinese Taipei. The girls were in no mood to go out though and took them to a nail-biting Tie Break where each of the GBR girls hit the nine ring and, with only one of Taipei girls shooting gold, GBR were into the World Semi-Finals! Here they met Russia who proved just too strong but this put them into the World Team Bronze Medal match against The Philippines. With a European Gold in their first competition together as a team, the girls were not looking to go home empty handed from their first World Junior Championships and so it proved with an emphatic 6-2 win. 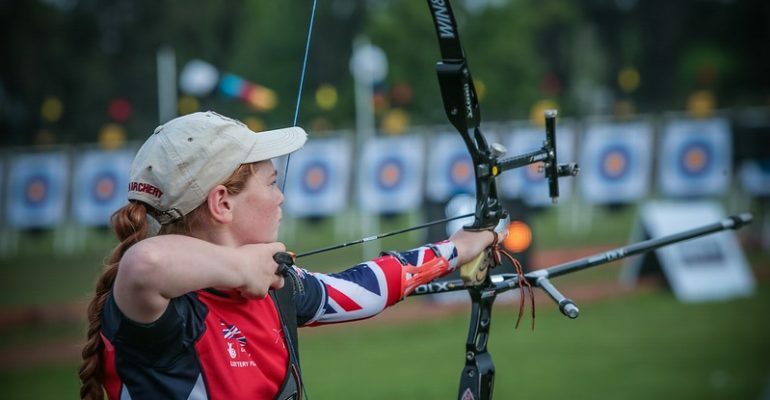 Please see here a link to coverage of their match on the World Archery website: https://worldarchery.org/news/153718/8-team-bronze-medals-awarded-world-youth-championships , pan down to point five for a photo of Louisa and her first press quote! Overall GBR came equal forth in the medal table behind USA, Korea and Mexico, first in Europe, and the girls were so proud to have played their part in GBRs World Youth Championship team!